Q: Hi Tony. I have dark brown hair with coarse greys that don&apos;t absorb hair dye. I was tired of the greys, so I had highlights put in to disguise them. Now, I have dreadful light blonde highlights that look ashy and grey mixed in with my dark brown hair. A: Robyn, with coarse grey hair, if it&apos;s not absorbing hair dye, the best way to approach it is to pre-soften the hair before colouring. That means you should use 10 volume peroxide on the hair to open up the cuticle and get it ready for the colour to penetrate. 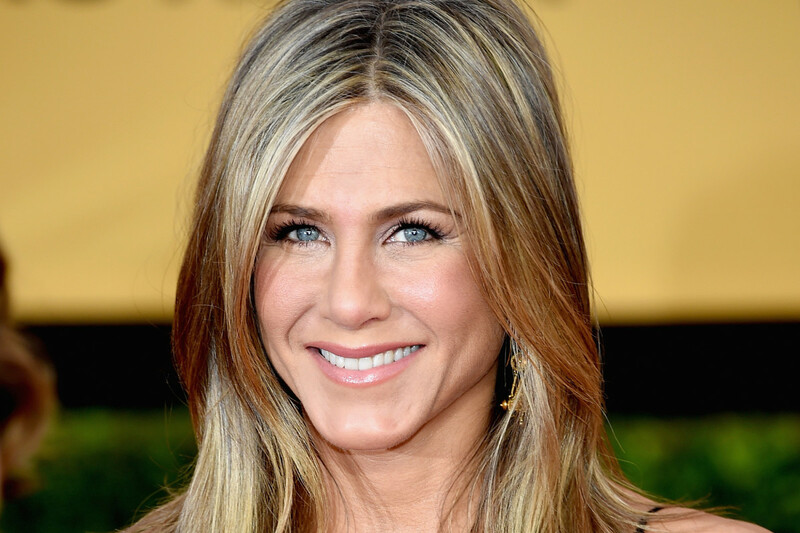 Jennifer Aniston at the 2015 SAG Awards. You could use lightener with 5 volume peroxide. Make it runny and apply it on the mid-shaft toward the ends, where the ash is. That will lift them to a lighter blonde. Then right after, you need to rinse and use a toner made out of Schwarzkopf 9-55 and 0-55 with 10 volume peroxide. Make it runny again, and leave it on for about seven to eight minutes. That should give you soft, golden highlights with your natural colour and little bit of grey. The gold will soften the brown and the grey. Miley Cyrus at the 2011 Grammy Awards.